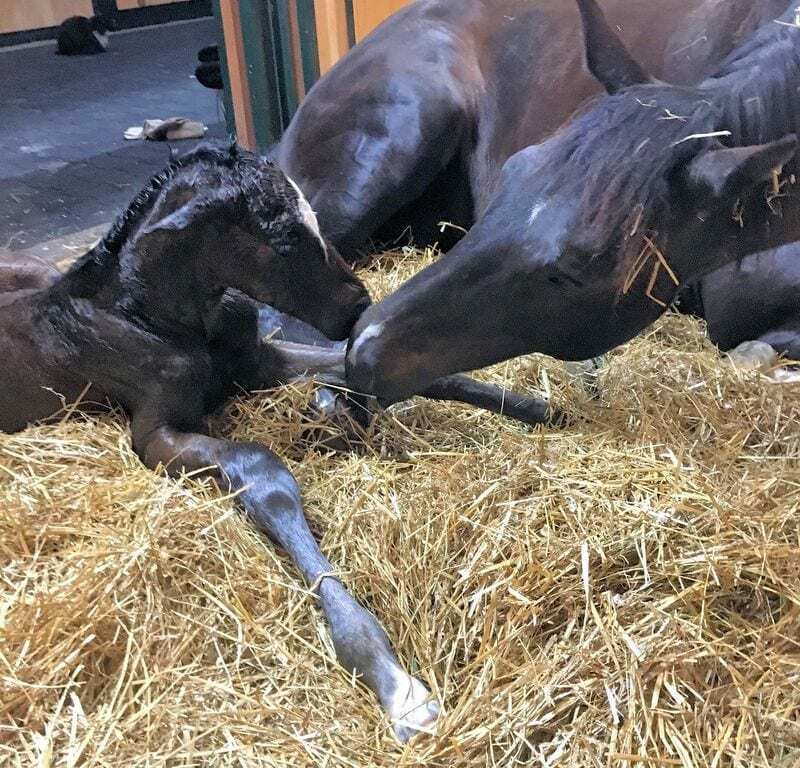 Memento d'Oro, a daughter of Medaglia d'Oro owned by Old Tavern Farm in Saratoga Springs, N.Y., delivered the fifth foal of the National Museum of Racing and Hall of Fame's Foal Patrol project at 12:35 a.m. this morning. The foal, a filly by Bodemeister, was an early arrival, as the farm had a projected foaling date of March 30. Both Memento d'Oro and the foal are in perfect health. The live feed of Memento d'Oro and her foal can be viewed at www.foalpatrol.com. The next Foal Patrol mares scheduled to deliver are Bird Town at Gainesway Farm in Kentucky and Via Veneto at Double Diamond Farm in Florida. Both mares are projected to give birth in late April. Bird Town, who won the Kentucky Oaks in stakes-record time, is now live on Foal Patrol, while Via Veneto's feed is expected to be available in the next couple days. Fans of Foal Patrol can also keep up on all the news and live videos of the mares that have already given birth and follow their interactions with their foals: Sabbatical (Claiborne Farm), Stopchargingmaria (Three Chimneys), Centre Court (Shawnee Farm) and La Verdad (Edition Farm). Their progress can also be followed at www.foalpatrol.com. Foal Patrol followers can sign up for contests on the website, including a grand prize of box seats for six at the 2018 Kentucky Derby and Kentucky Oaks, courtesy of Marylou Whitney and John Hendrickson, the Museum president. This entry was posted in Bloodstock, NL List and tagged Bodemeister, foal patrol, ghostzapper, memento d'oro by Press Release. Bookmark the permalink.